The non-contact handling of glass is critical to the Flat Panel Display (FPD) and Photovoltaic (PV) Solar Panel manufacturing processes. This is due to yield-reducing damage which occurs any time the glass contacts a processing or conveying surface. New Way provides a line of scalable, modular solutions to this need. Often, two or more New Way product lines are integrated into a single glass conveying, processing and/or inspection array. These products include: precision zone air bars; transition zone air bars; and flotation zone air bars. You’ll find more specific information about these applications below. FPD Manufacturers seeking to enhance their yield recognized that eliminating contact during glass-handling was a critical step. New Way Porous Media TechnologyTM provides an ideal solution because air is distributed evenly across the entire conveying or ‘chucking’ surface, so it is virtually impossible for the glass to touch down. Essentially, air is forced through millions of sub-micron sized holes in the ‘bearing’ surface of a modular New Way product. This surface is a proprietary carbon which is, in itself, inherently a bearing surface. So even with a catastrophic loss of air pressure, damage will be minimized…especially because it will take time for the air beneath the glass to dissipate. The result is that the glass sheet is set gently down on the surface, to await the re-application of air pressure. Even in contact situations, the carbon does not particulate during use. It has been analyzed, and found to not contribute to ISO Class 10 clean rooms. In fact, it acts almost as a filter to incoming air – much in the way a HEPA filter acts – thereby ensuring that New Way Air Bars are compatible with clean room environments. This level of control is made possible using vacuum in conjunction with the air pressure. Once an appropriate balance is achieved, it is possible for engineers to ‘dial in’ a level of precision previously unachievable. New Way offers a line of modular air bars that are easy to install, and are designed to fit a wide array of requirements – from high speed conveyance, to lower control. New Way also offers a precision air bar product engineered for use under or near precision glass inspection and optimization process stations. They provide a much higher level of precision, stiffness, and damping than even our own transition and flotation zone air bars. In many ‘Fabs’ around the world, compressed air availability or compressor capacity limit the amount of consumable air available for the process. In some cases, only blowers may be available. In other cases, such as in clean room applications, it is also preferable to minimize flow and the resulting currents or eddies that can impact a process. New Way transition zone air bars were designed specifically to address such applications. Unlike orifice-based air bearings, consumables are measured in liters-per-hour NOT in liters-per-minute. This factor alone significantly reduces the potential for issues…by many magnitudes. Individual transition zone air bar components are arrayed according to the conveying needs of the application. Five different sizes are available to make an engineer’s design as easy as possible. Sheets of FPD or Solar Module glass (up to Generation 10 and beyond) are then conveyed on the thin layer of air distributed by New Way Porous Media across the face of the array, completely without contact. Thin though it is, this air layer creates an amazingly stiff and stable support. A nominal amount of vacuum is used to prevent the glass sheet from sailing, while providing some level of stability and control. It also flattens the glass, while reducing surface vibration. Flutter and instability are minimized as the entire sheet is ‘fixtured’ in space, balanced between the forces of air pressure and vacuum. The repeatability of the glass fly height and the high stiffness of the air bar arrays, combined with fast vibration damping of the glass, allows for greater resolution in scanning than previously attainable with mechanical contact means of conveyance. High motion control resolution also becomes possible, since the co-efficient of static and moving friction is virtually eliminated in the sheet, allowing for sub-micron resolution of glass orientation. This is ideal for the processing of flat panel glass as well as optical inspection. Finally, sSurface speeds of up to 100 meters-per-second are theoretically possible and, although this is not feasible with large glass sheets, since the sheet itself cannot be accelerated this rapidly, manufacturing speeds of 2-3 meters-per-second are easily achievable. Not only are faster speeds possible, without ‘sailing,’ but the additional vacuum enables even tighter non-contact control. 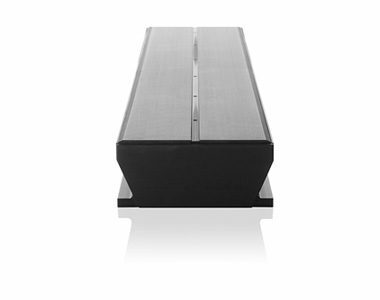 This is because the vacuum design creates a pre-load stiffness and ‘hold down’ force which inhibits the lifting of the sheet from the conveyors during rapid motion. This pre-load force also flattens out the glass, significantly aiding in the high contrast analysis of the glass surface which is so critical to the flat panel display industry. For situations where control is less of a requirement, New Way has developed the flotation zone air bar. This modular component eliminates both the carbon face, and also the series of vacuum holes that are a defining feature of the company’s transition zone air bars. This more-economical product enables a totally integrated approach to your processing needs. New Way has developed an even more specialized product for ‘areas of interest’ in the FPD and PV Solar Module manufacturing processes. 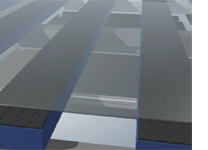 The company’s porous media precision zone air bars combine an even tighter array of vacuum holes with a grid of vacuum grooves for tight fly height control in processing or inspection zones. In fact, this modular product is designed so that as the glass moves on and off the air bar, the vacuum pressures and air gaps remain the same, ensuring consistent glass height and stability – from the lead edge of the glass to the trailing edge – allowing for analysis and inspection of a greater percentage of the entire glass sheet. The system provides non-contact control of ±5µm at a fly height of 25µm, well within the 25-35µm focal range for FPD glass inspection cameras and other, similar operations.